Climbing the Mountain Huayna Picchu is one of the adventures that most people want when visiting Machu Picchu, and we say most, because not all people can overcome their fear of heights to reach the top. The Huayna Picchu mountain rises 2,720 meters above sea level, over 350 m above the Inca city of Machu Picchu, is covered with vegetation and houses one of the best-built Inca structures of Machu Picchu, the Temple of the Moon. Why do so many people want to climb Huayna Picchu? There are many reasons why people want to climb this mountain, you may also have a reason to reach the top; Without exaggerating, the summit of this mountain has captivated and inspired thousands of people. Walking the trails to the top of the Huayna Picchu Mountain is one of those experiences that you will remember all your life, the mountain is to the north side of the Inca City; It is reached by a very steep path with hundreds of steps, some carved in the very rock of the mountain. In some sections you will have to hold steel cables to continue the ascent; But that’s not all; most of the trail is built on one side of the mountain, so on the other side of the trail, you will have spectacular abysses of hundreds of meters; These make people afraid of heights, think twice before ascending this mountain; However, with proper implementation and following signage, the road is safe, and can be traversed by children up to 12 years old. The trails along the Huayna Picchu are safe; Moreover, the cases of accidents recorded in Machu Picchu and the surrounding area are due to the irresponsibility of some visitors, who do not respect the safety lanes, or by those who believe they can find their way on their own. 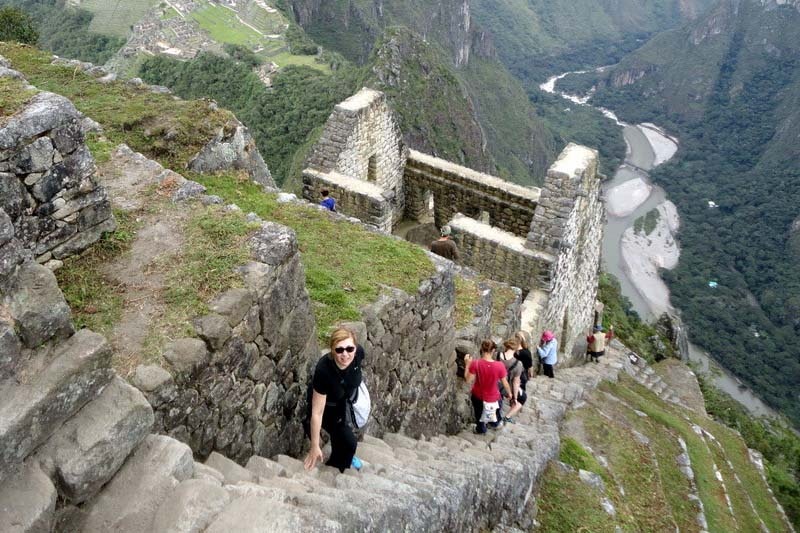 If you suffer from vertigo or fear of heights, we recommend you to check other short walks in Machu Picchu. Very close to the top of the mountain you will find agricultural terraces that had to function like ornamental gardens (ends), built next to the mountain; But you will also find an amazing natural cave; Inside one can appreciate one of the best works of stone carving of the whole National Park of Machu Picchu, is known as the Temple of the Moon, and certainly worth all the ascent to see this amazing structure. 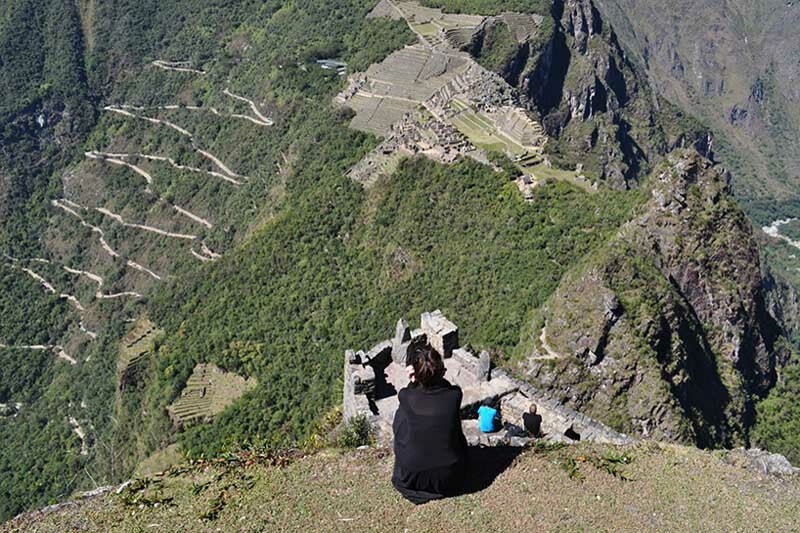 The views you can get from the Inca city of Machu Picchu, from the top of the Huayna Picchu Mountain, will leave you absorbed. It is located on one of the peaks, a pair of mountains surrounded by the Urubamba River, and “hidden” in the middle of a labyrinth of mountains belonging to the chains of the Andes. And in case you did not know, the environment of Machu Picchu is considered one of the most amazing places on the planet. Do you already have your reasons? Machu Picchu is one of the most inspiring places in the world, and you already know some of the reasons why people climb to the top of the Huayna Picchu mountain; But we know that each person has their own reasons for reaching the top; If you already have yours, Book the Huayna Picchu Ticket now. The Machu Picchu + Huayna Picchu Tickets must be booked 6 months in advance; Can be booked with some less time, but it will have to be content with the remaining availability.